Caroline Ferriday works at the New York French Consulate. Well, she doesn't work there really, she doesn't get paid, but she puts her heart and soul into ensuring the welfare of French immigrants. When Hitler invades Poland and sets his sights on France, her life turns upside down. Of course, Kasia Kuzmerick's life takes an even worse turn when Hitler invades her home country, but she works with the Polish underground to retain some sense of independence. In a neighborhood surrounded by hopeful Poles and resentful Germans, one slip can lead to death. Herta Oberheuser sees a sign for a government medical position and recognizes it as a great way to show that she can be as good as a male doctor. Unfortunately, she finds herself stuck in a Nazi camp working with even more dominating males. All their lives are about to change forever, when Kasia's sent to Ravensbruck, a Nazi women's concentration camp. The world has changed, but Kasia and Caroline are determined not to let them forget the unspeakable tragedies of the War. Lilac Girls was one of my favourite books of the year. I can't believe that I waited so long to read this fabulous novel! Based on a true story ( two of the characters are inspired by real-life women), the novel explores the complexities of war from various perspectives. 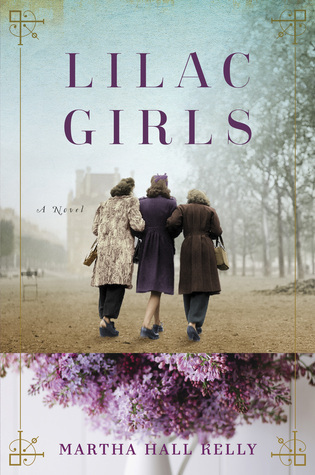 Told from the view-point of a victim of Nazi brutality, an executor of Nazi brutality and a socialite working to defend victims of Nazi brutality, "Lilac Girls" takes you full circle on the perspectives presented in World War II. Kelly even managed to make me laugh with her sudden introductions to events and dry recollections of fond memories. This is not say that the writing wasn't emotional. I was a train wreck while reading this novel. Switching from Herta to Kasia to Caroline was like instructing my mind to turn off one emotion and turn on the next. Kelly included the occasional joke, but the majority of her writing was compelling and fluid, hard qualities to achieve while writing about three different main characters. I'd recommend this book to lovers of Kristin Hannah and Anthony Doerr. If you haven't read these authors but love Historical Fiction, you'll definitely love this book- and you should go check out Hannah and Doerr as well! Anyone who enjoys WWII books and not necessarily other Historical Fictions- don't hesitate to pick this up! Seriously, next time you're at a bookstore, or staring at Amazon, look up and buy "Lilac Girls"! WWII/Holocaust is one of my all-time fav topics for any story [cook, movies, TV show etc] now after reading your review I HAVE to read this book!